Before you purchase or sell your home or property, please call the Home Inspection King! We can help protect your investment with a thorough real property/ home inspection! Contact us now to discuss your individual inspection needs. 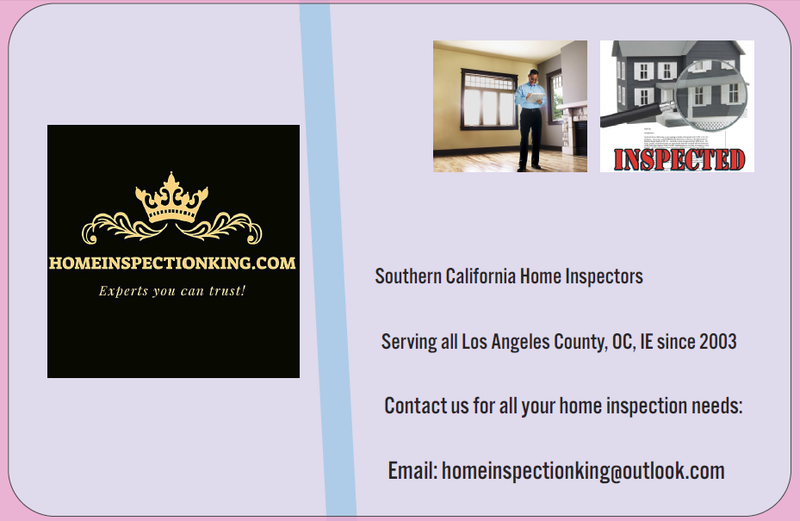 Home Inspection King was founded in Southern California in 2007. Our team of experienced Real Estate Inspector, perform thorough inspections at reasonable cost throughout Southern California . We can help you get to know the condition of the property you are about to sell, negotiate or buy and give you the confidence you need to make an informed decision at this critical moment whether you are already in escrow or in the process to possibly purchase or sell the property. We are located in Los Angeles county and serve all surrounding areas. We look forward to shareour knowledge and expertise with you! We use state of the art technology in our daily home inspections and our clients are always so impressed to find out how we combine these new technologies with our experience in order to provide a professional report to our customers! you won't believe how many home buyers and sellers who already have a home inspection report from a competitor call to hire us because they know we will not rush into an inspection like the others guys! we will take our time and provide a top quality, highly detailed and professional home inspection report. Keep in mind however, that every home inspection report is unique and individualized to your specific home. A typical home inspection report can range anywhere from 32 pages up to 90 pages or more, depending on the age and condition of the property. Although you may find in our reports issues reported or not reported related to the following specialities, we do not claim to be Foundations expert, Structural Engineer, civil engineer, mold specialist, asbestos abatement specialist, plumber, Electrician, Heating or AC - HVAC company nor Roofing - Roofer. We conduct a non-invasive visual inspection and report simply our observation and opinions. We always recommend to our clients to consult with a certified and licensed specialist regarding Structural and civil Engineering, mold, asbestos and other toxic carcinogens coming from the building itself, appliances, air, water or building material, regarding termites, insects and rodents infestations and damages, Heating HVAC, Electricity and wiring, plumbing, roofing, painting, appliances, building codes, Fire safety etc..
A home inspector is not an expert in all the field and specialities mentioned above and for detailed and in-depth answers and findings, a home owner should consult the proper field specialist regarding that field of expertise. That being said, a home inspection can reveal which issues observed by the home inspector may need immediate attention and needs to be serviced by a licensed specialist. Many home inspection companies boast about “on-site” delivered reports. This is a way for mistakes to be made. After we complete our inspection of the home we take HD 4k videos and HD pictures and notes back to the office to prepare your report. This is a critical part of the home inspection process. Mistakes can easily be made by trying to present you with a report “on-site.” our report process can take 5-8 hours to complete. Once completed, you will be emailed a PDF version of your home inspection, complete with color coded text and photos. We never rush our home inspections. At most we schedule one home inspection per day. If your home needs more attention (large, old, and/or in “fixer-upper” condition) we’ll dedicate as much time as it takes, up to a day or more, for your inspection. Our home inspections and reports are completed and prepared by the NAHI (National Association of Home Inspectors, Inc) Standards of Practice.